To continue from the MW-15, it's been a total turntable. Just the opposite of what was required has happened. No W.D. was expected, but on the 19th., a sudden trough in the upper air at 200mb. forced its way through north India, with induced lows in the lower atmosphere over the plains of north India. Resultantly, its "cold" and raining in the plains of north India now since the last 3 days. Instead of the expected heat wave when temperatures anomollies are required to be +6c, its -15c in Delhi and -5-10c at many other places in the region. Delhi with a high of 24c at Palam and 25c at S'jung, on the 21st, is 15c below normal . Amritsar, Chandigarh and Patiala were 17-18c as the minimum and all over Punjab the days were a pleasant 25-28c. Much below the normal 40+ expected during this time ! Is it May or November? The IMD max. temperature deviation map shows the entire region in the below normal colours. The W.D. has precipitated fairly good amounts of rain all over the plains of Punjab,Haryana and west U.P., Delhi being specially targeted with 60mm of rain at the ridge on 21st. In Pakistan too, the heat was a bit easy today(22nd. ), with the highest being 46c at Nawabshah. The 200mb winds were still strong in the west-east direction as on the 22nd, and are expected to ease by the 25th. thus letting go the prevailing W.D. The result of this: 1. The heat low, which was at 998 mb, is now back to 1000mb, and restricted to the Pakistan side of the border. The Indian side shows no specific seasonal low tendencies now. 2.As per IMD, a low is expected in the south-east Arabian sea around the 23rd. The existing upper air trough in the north,the "cool" temperatures there, and the absence of a reasonable heat low over the land mass of India, may direct the low to concentrate and move north-west towards south Oman. As per ECMWF,it can become a very deep depression, or a cyclone, and cross the south Oman coast.As to when it will cross, is too early to forecast now, but could be around 1st. June. Requires monitoring after the formation of the low. 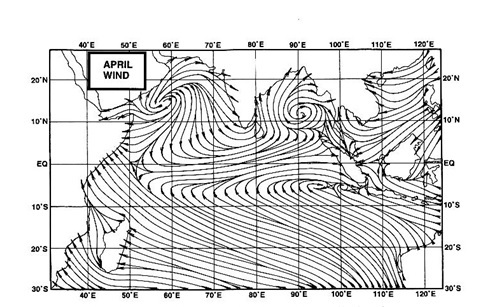 The sst of the Arabian Sea(picture) shows sufficient heating for this. As a result, if this happens, the monsoon may touch the Kerala coast by the 28/29 of May, but as a feeble current. And the feeble monsoon may slide upto coastal Kerala and Karnataka in 2 days, but remain weak for the next 6/7 days. The Bay sst in the picture above is still seen as below normal. No forecast model indicates any major revival of rains in the bay, for the next 10-12 days.